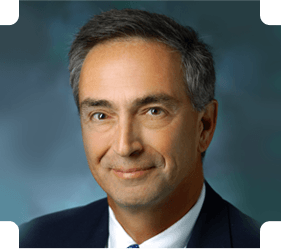 Dr. Anthony S. Unger, MD, is the nationally recognized expert in Total Joint Replacement and Minimally Invasive Surgery. He is a regular lecturer, teacher and researcher for these techniques and educates physicians around the world in this discipline. His expertise in Anterior Hip Replacement Surgery draws patients from around the world. Dr. Unger also has developed several new implants and technologies and has been awarded multiple U.S. patents in the area of Hip and Knee Replacement Surgery. Dr. Unger is board-certified by the American Board of Orthopaedic Surgery. Director, Washington Center for Hip and Knee Surgery, Washington, D.C.
Unger, A.S., Stambough, J.L., & Brighton, C.T. ; Electrical Stimulation of Bovine Chondrocyte Pellets Using a Capacitively Couples Signal. Transactions of the 29th Annual Orthopaedic Research Society, Volume 8, page 199, 1983. Bora, F.W., Unger, A.S. and Osterman, A.L. ; The Local Inhibition of Nerve Scar by the Biodegradable Vehicle Chronomer Carrying CisHydroxyproline. Transactions of the 29th Annual Orthopaedic Research Society, Volume 8, page 278, 1983. Unger, A.S., Steinberg, M.E., Jimenez, S.A., Bashey, R.I. and Pollack, S.; Effects of Collagen Crosslinking on Stress-Generated Potentials (SGPS) in Tendon. Surgical Forum, Volume XXXIV, page 563, 1983. Unger, A.S. and Booth, R.E. ; Disseminated Intravascular Coagulopathy in a Patient Undergoing Total Hip Replacement for Carcinoma; A Case Report, CORR, 183:76, 1984. Cartilage Chondrocytes in Various Capacitively Coupled Electrical Fields. J. Ortho. Res., 2 (1) :15-24, 1984. Kurz, L.T., Garfin, S.R., Unger, A.S., Thorne, R.O., and Rothman, R.H.; Lumbar Intraspinal Extradural Ganglion Cyst as a Cause of Sciatica. JBJS, 67A, 865, 1985. Kaplan, F.S., Goll, S.R., Unger, A.S. and Schumacher, H.R. ; Heterotopic of the Elbows and Spine in a Young Man with Paraplegia. Orthopaedic Review, XIV: 485, 1985. Unger, A.S. and Steinberg, M.E. ; Femoral Endoprosthetic Replacement in YoUnger Adults, The University of Pennsylvania Orthopaedic Journal, 2:79, 1986. Gecha, S.R., Unger, A.S., Nichols, C., III, Balduni, F.C., Gregg, J.R. and Torg, J.S. ; Lateral Retinacular Release for Treatment of Patellofemoral Pain, The University of Pennsylvania Orthopaedic Journal, 2:67, 1986. Vol. XV, page 33, 1986. Unger, A.S., Inglis, A.E., Ranawat, C.S. and Johansson, N.A. ; Total Hip Arthroplasty in Rheumatoid Arthritis: A Long Term Follow Up Study. J of Arthroplasty 2:191, 1987. Unger, A.S., Inglis, A.E., Mow, C.S. and Figgie, III, H.E. ; Total Ankle Arthroplasty in Rheumatoid Arthritis: A Long Term Follow Up Study. Foot and Ankle 8:173, 1988. Spaulding, J.M., Meyes, R.G., Figgie, H.E., III, Unger, A.S. and Inglis, A.E. ; Total Ankle Arthroplasty: A Procedural Review, AORN Journal 48:201, 1988. Unger, A.S.; Total Elbow Arthroplasty, Int. Medicine 9:73, 1988. Bohn, W.W., Johanson, N.A., Schneider, R. and Unger, A.S.: Symptomatic Corticosteroid-Induced Osteonecrosis of the Knee, American Journal of Knee Surgery, 1:105, 1989. Unger, A.S., Lewis, R.J. and Kessler, C.M. ; Total Knee Arthroplasty in Human Immunodeficiency Virus-infected Hemophiliacs; J. Arthroplasty, Vol. 10 No. 4, 448-452, 1995. Brighton, C.T., Unger, A.S., and Stambough, J.L. ; In Vitro Capacitively Coupled Electrical Stimulation of Bovine Articular Chondocyte Pellets in Varying Serum Concentrations, 2nd Annual BRAGS 1982, Oxford, U.K.
Steinberg, M.D., Unger, A.S., Jimenez, S.A., Bashey, R.I., and Pollack, S.R. ; The Effect of Crosslinking on Stress Generated Potentials (SGPS) in Tendon, 2nd Annual BRAG S 1982, Oxford U.K.
Bora, F.W., Unger, A.S. and Osterman, A.S.; The Local Inhibition of Nerve Scan by the Biodegradable Vehicle Chronomer Carrying Cis-Hydroxyproline, 29th Annual ORS 1983, Anaheim, CA. Unger, A.S., Stambough, J.L. and Brighton, C.T. ; Electrical Stimulation of Bovine Articular Chondrocyte Pellets Using a Capacitively Coupled Signal, 29th Annual ORS 1983, Anaheim, CA. Steinberg, M.E. and Unger, A.S.; Femoral Endoprosthetic Replacement in YoUnger Patients, 52nd AAOS 1985, New York, NY. Inglis, A.E. and Unger, A.S.; Total Shoulder and Elbow Arthroplasty, Summer Institute AAOS 1985, New York, NY. Unger, A.S. and Shuster, H.F.; Post-operative Roentgenographic Factors in the Prediction of Healing Displaced Subcapital Hip Fractures, Pennsylvania Orthopaedic Society, 1985, Philadelphia, PA.
Unger, A.S., Inglis, A.E., Ranawat, C.S., Johanson, N.; Long Term Follow Up of Total Hip Arthroplasty in Rheumatoid Arthritis, AAOS , 1987, San Francisco, CA. Unger, A.S., Inglis, A.E., Mow, C. and Figgie, H.; Long Term Follow Up of Total Ankle Arthroplasty in Rheumatoid Arthritis. Foot and Ankle Society, 1987, San Francisco, CA. DePasquale, D., Lewis, R.J. and Unger, A.S.; Bilateral Total Knee Arthroplasty In Hemophiliacs, AAOS, 1988, Las Vegas, NV. Unger, A.S., Kessler, C. and Lewis, R.J.; Total Knee Replacement in HIV Infected Hemophiliacs, AAOS, 1992, Washington, DC. Unger, A.S.; Cementless Acetabular Revision Using Trabecular Metal, Current Concepts In Reconstructive Surgery, Whistler, BC, 2001. Bora, F.W. and Unger, A.S.; The Inhibition of Scar After Tendon and Nerve Injury in Soft and Hard Tissue Repair, Biological and Clinical Aspects, Edited by Thomas K. Hunt, R. Bruce Heppenstall, Eli Pines ad David Rovec, Prager Special Studies, 1984, New York. Unger, A.S., Inglis, A.E. and Figgie, III, H.E. ; Total Ankle Arthroplasty inOperative Orthopaedics, Edited by Michael W. Chapman, J.B. Lippincott, 1988, Philadelphia, PA.
Unger, A.S., Ranawat, C.S. and Lewis, R.J.; The Rheumatoid Hip in The Hip, Edited by Richard A. Balderston, Richard H. Rothman, Robert E. Booth and William J. Hozack, Lea & Febiger, 1992, Philadelphia, PA.
Figgie, III, H.E., Unger, A.S., Inglis, A.E., Kraay, M.J., Figgie, M.P. ; Total Ankle Arthroplasty in Operative Orthopaedics, Second Edition, Edited by Michael W. Chapman, J.B. Lippincott, 1993, Philadelphia, PA.
Unger, A.S., Kessler, C. and Lewis, R.J.; Hemophilia and Pigmented Villonodular Synovitis in Surgery of the Knee, Edited by W. Norman Scott, MD, Churcill Livingstone, 2005, Philiadelphia, PA.